David Cohen is a local photographer on Bainbridge Island. In 2012 Cohen's family moved from the Island to Zutphen - a small village in Holland. He took a photo or a series of images every day in order to have a visual memory everyday away from home. 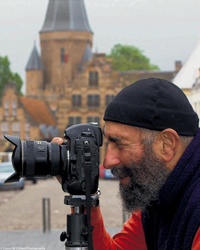 His eBook Opening Up and Letting Go (2015) chronicles the images of places, people, events and landscapes as seen through his eyes and felt by his heart. 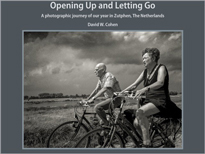 Cohen provides the reader his unique view of the cultural differences and similarities during the 13 month adventure abroad as well as everyday life in Zutphen. For more information go to the author's eBook Blog: http://davidwcohenphotographyblog.blogspot.com/ or his eBook on the iBook Store: https://itunes.apple.com/us/book/id997541918?mt=11&ign-mpt=uo=6. The eBook will also be sold locally by Eagle Harbor bookstore.